Citizens of CBS who are elected to the legislative branch represent their towns in the 49-member Cornhusker Boys’ State Legislature. Once elected, senators of the newly convened legislature choose several peers as the legislative leaders who will preside over subsequent debate. CBS legislative officers include the Sergeant at Arms, Chaplain, Clerk, and Speaker. Several sessions of the legislature are held throughout the week. Bills written by the senators are introduced on first reading, are considered in committees, and may advance through general file, select file, and final reading. Bills passed by the legislature are submitted to the sitting Cornhusker Boys’ State governor for his signature or veto. 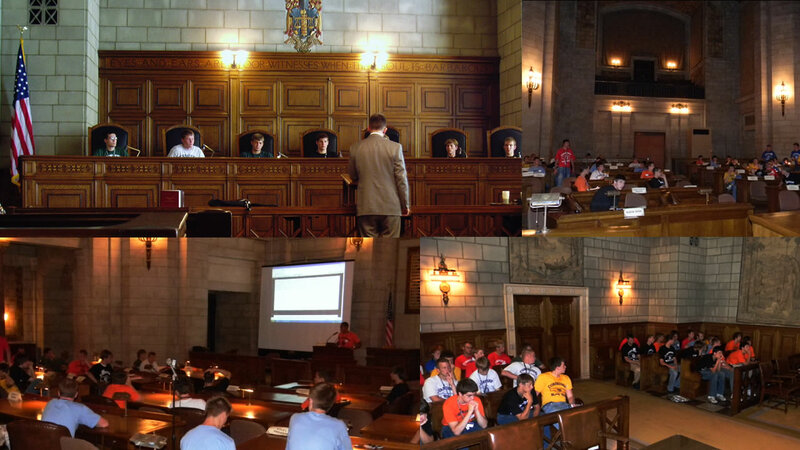 These steps, which accurately simulate the actual procedures of the Nebraska Unicameral, serve to prepare CBS Senators for the unique privilege of holding a legislative session within the grand surroundings of the Warner Chamber, located within the historic Nebraska Capitol. Copyright ©2016 Cornhusker Boys State. All Rights Reserved.